Wacko! 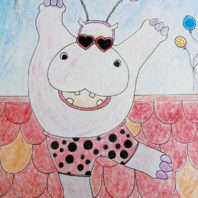 Help little KK and her hippo friend recreate this classic story through wild movement and sound. There will be colour, music, movement and quite a bit of nonsensical mayhem! Dressing up in psychedelic party costumes encouraged. RV and KK are a booty-shaking, toe-tapping, party-popping pair who make up half of good-time dance foursome ‘The Bowie Dancers’.